... the revival’s collapse has had a ripple effect, forcing the cancellation of a second Simon production, Broadway Bound, which was to have opened at the same theater (the Nederlander) in December and then run in repertory with Brighton Beach Memoirs. Yet its failure — the shortest run ever for a Simon play on Broadway — stands in contrast to the healthy box-office activity of several star-driven productions such as A Steady Rain, featuring the one-two punch of Hugh Jackman and Daniel Craig; a revival of Hamlet, starring Jude Law as Shakespeare’s melancholy Danish prince, and God of Carnage, last season’s best-play Tony winner, with a cast of James Gandolfini, Marcia Gay Harden, Jeff Daniels and Hope Davis. It is evident that, generally speaking, stars help. But, there isn't a guarantee of success. Last season, Jane Fonda, Geoffrey Rush, Susan Sarandon and John Leguizamo all appeared in shows. None of which earned back their production costs. 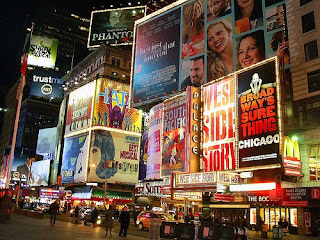 Yet more stars are on tap to appear in Broadway’s almost three dozen theaters despite the difficult economic climate. Some of the names on the marquees are Catherine Zeta-Jones, Angela Lansbury, Abigail Breslin, Sean Hayes, Kristin Chenoweth, Nathan Lane, and Bebe Neuwirth. In addition to the star laden shows, Broadway is also keeping an eye on how the fall’s two new musicals — Memphis and Fela! — do ... neither of which have any A-listers gracing their Playbills. David Richenthal, producer of Finian’s Rainbow, and the upcoming Miracle Worker, starring Abigail Breslin as Helen Keller, is optimistic. The new show opens in March at Circle in the Square Theatre, an in-the-round playhouse not used as frequently as more conventional proscenium Broadway theaters. “It would be disingenuous to pretend ‘Oh, we had a brilliant idea, let’s do it in the round,’” Richenthal said. “But you can make a virtue out of necessity. Theaters are more booked this season than any time in my memory in the 20 years I’ve producing. I think this is good. It's been said that many productions in recent years have been put together in a quick and dirty way just to ensure that there aren't any empty stages. Now, it seems that the pressure is on. Either you're really great, or get the hell out ... NEXT!